I have made my 2017 painting calendar. Now, it is available for purchase. To browse all painting images on the calendar, please visit my website: http://www.qh-art.com/calendar-2017.html then click the "store" tab. Enjoy! The third demo at Lindale. I want to get more abstract (in a good way). A long way to go. This is my second demo at the Lindale workshop. Tomorrow will be the Thanksgiving, I want to express my sincere gratitude to all my artist friends for supporting me. I wish all of you to have a wonderful holiday season. The day right after my Mt Pleasant workshop, my workshop at Lindale Texas started. This painting is my first demo. I want to thank Maureen Killaby for organizing and all the artists from Louisiana, Arkansas, and Texas for attending. 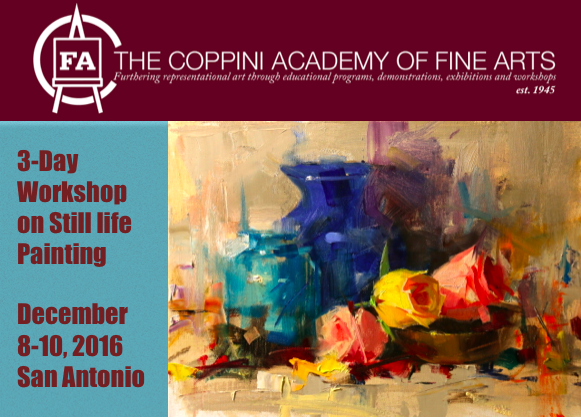 In early December, I will teach a 3-day still life painting workshop at the Coppini Academy of Fine Arts in San Antonio, Texas. We still have a few openings. If you would like learn the way I paint, please visit: http://www.thecoppini.org/event/qiang-huang-life-oil-painting/ to get detailed information and sign up. On the way to the workshop location I took a photo of a barn. I used this photo as my reference and did this demo painting. I still feel landscape is not my cup of tea. But I have found that my landscape is more welcomed than my still lives. Well I think I will do more. I have posted my 3rd demo, but forget about the 2nd one. Here it comes. Demo 3: high key with roses. I enjoyed the freedom of pushing colors when I paint floral paintings. I want to thank Linda Pepper and Mt Pleasant Art Association for organizing my workshop again. Thanks to all Texas and Arkansas artists for coming and painting with me. I am so happy coming back to east Texas. This is my first demo on the first day of the workshop. I have just finished a 4-day workshop at Mt. Pleasant, Texas. Before the workshop started, I did this open demo for the all the members of Mt. Pleasant Art Association. Time was quite limited, but I think I did all right. After my workshop ended, I painted with the Putney painters on the Saturday, Oct 29. It was a portrait painting day. We had a great model Scott. I have not painted portrait for a long time. As a matter of fact this is only my 2nd head study I did in 2016. I felt really rusty. Unfortunately, I did not see Richard Schmid that day, but I was so happy seeing Nancy Guzik, Carol Arnold, Kathy Anderson, Stephanie Birdsall, Mark Boedges, Rosemary Ladd, John Smith, and quite a few other artists. I was so enjoyed Putney. What a legendary place it is. "Demo at Putney 2016 4"
My last demo at Putney was a palette knife cityscape. I used one of my photos I took at Nanping Village in September when I was visiting China. I enjoyed very much of using palette knifes and I hope this style will mature in the near future. The workshop at Putney has two days of still life and two days of landscape. This is my demo painting landscape from a photo. The reference photo was shot at Concord MA. In August, I visited the Walden Pond and Concord. This small house is a replica of Thoreau's house. I really like Thoreau's philosophy.